Knowing your child must face a root canal treatment can bring you unwanted anxiety. Perhaps you had a bad experience with one, or simply heard others complain about the procedure they had. Either way, let us relieve your anxiety. When you receive pediatric root canals by Lowell dentist, Dr. Simon Beylin, you can rest assured that you are receiving the best treatment available. Thorough Explanation – After you have received diagnosis of the condition and necessary treatment, be assured that Dr. Beylin and staff will give you all the information you need concerning the procedure. They will patiently explain why it is the best option for your child, what will happen during the procedure, and all the information you will need to know for care at home. At Kangaroo Smiles, we are happy to answer any of your questions throughout the entire process. Calm Environment – When you and your child arrive at the office, you will be calmed by our soothing, but kid-friendly waiting room. 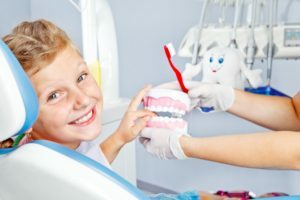 Painless Dentistry – After your child has been comfortably settled into the treatment room, local anesthesia will be administered in order to eliminate any pain during the procedure. This also allows the dentist the best concentration for performing the root canal. Procedure Specifics – In order to perform the root canal treatment in a dry, uncontaminated environment your dentist will place a “rubber dam” on the tooth being treated. This isolates the tooth from the mouth and allows for the best possible results. Dr. Beylin will then scrape the infected part of the tooth out, prepare it for the filling by rinsing and cleaning, and then fill with a substance that hardens, usually a material known as guttapercha. A temporary cap will then be placed upon the tooth. Follow up Finishing – Pediatric root canals by Lowell dentists must then be followed up by a crown, or cap, in order to seal the tooth and provide the appropriate finishing restoration. Your dentist will also request periodic checkups with your child in order to assess the success of the treatment.